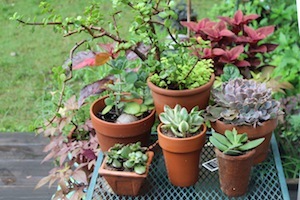 Echeveria, Crassula, Sempervivum, and sedum: These names do not roll easily off the tongue. They are the interesting, often colorfully leaved, and sometimes fuzzy plants known collectively as succulents. The names might not be easy to pronounce but you probably won’t find an easier-to-grow selection of plants. 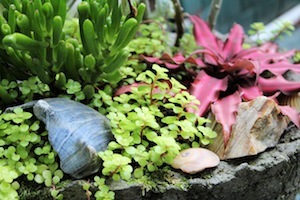 You can grow succulents in just about anything that allows the water to drain through the root area. Use a purchased cactus mix or a mixture of half sand and half potting mix for your planting media. Now comes the fun part, finding the right container. I used a small tin washtub as a form to make a hypertufa container. 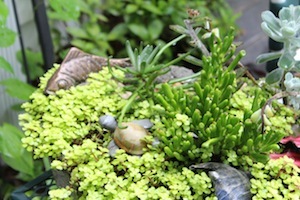 It became the perfect spot to set up a small undersea world using succulents to mimic seaweed and coral. I added a brass goldfish, a turtle made out of a rock, and some shells I found at Edisto Beach to finish off my small ocean reef. I can’t take credit for this idea but I am afraid I have forgotten where I first saw it. 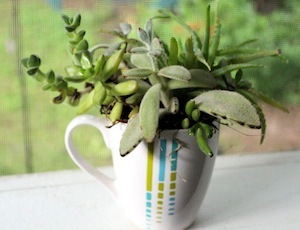 A retro coffee mug jammed full of small succulents I purchased a couple years ago lives on my kitchen window in the winter and the screened porch in the summer. Little china teacups also make lovely presentations. Wouldn’t they make cute little place favors and take-home gifts for a luncheon? My friend Linda Christine buys high heel shoes and tennis shoes from used clothing outlets like Goodwill Industries or local church sponsored stores. She drills holes in the soles, adds soil mix, and fills them with interesting little plants. Full sun for a few hours a day will help to keep the succulents from “stretching,” which is what has happened to my little strawberry jar of plants. I placed the jar on the ground. Some nearby plants and the jar itself shaded the bottom tiers causing them to reach for the light. 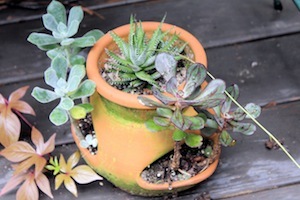 Adding single specimens to small clay pots, then grouping them together, is another way to display succulents. I like them lifted up on a small table so that I can look down at them. Many of their shapes are most interesting viewed from the top. Give them a sunny spot, only water about once a week, feed with a weak solution (half strength) fertilizer and since most are not hardy, winter them indoors. Cut back even more on the watering during the winter inside and don’t fertilize until spring when you move them back outdoors.